Honda is slated to reveal a prototype of its upcoming Urban EV at the Geneva Motor Show. The automaker has already provided us a sneak peak of it a few days ago, but now Honda is showing off its interior with the above teaser image. Much like the car’s exterior, the interior appears to be a bit retro. Its boxy style is pairing with a very clean layout that harkens back to the early 1990’s when it comes to interior design. The bigger news here is the massive sea of screens found on the dashboard, which extend from the gauge cluster all the way to the edge of the passenger compartment. The screens appear to be touchscreens, with additional physical buttons in the area traditionally known as the center stack. 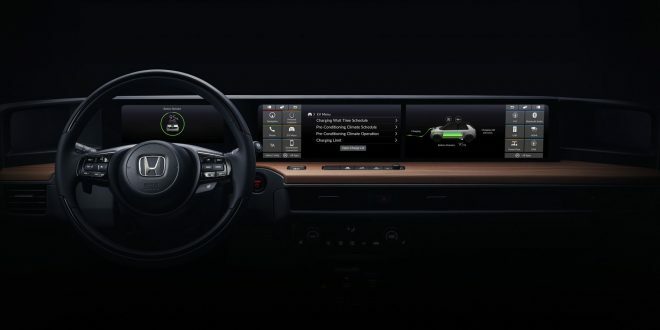 The photo does confirm the car will have lane keep assist, a heated steering wheel and a host of EV related options. Unfortunately, details regarding the car’s battery-electric powertrain are still unknown at this time. Expect further details during the car’s reveal next month, when the Urban EV bows in Geneva. Expect this car to be a mostly production-ready iteration of the Urban EV concepts Honda showed in 2017. This car is expected to go on sale in Europe by the end of the year.